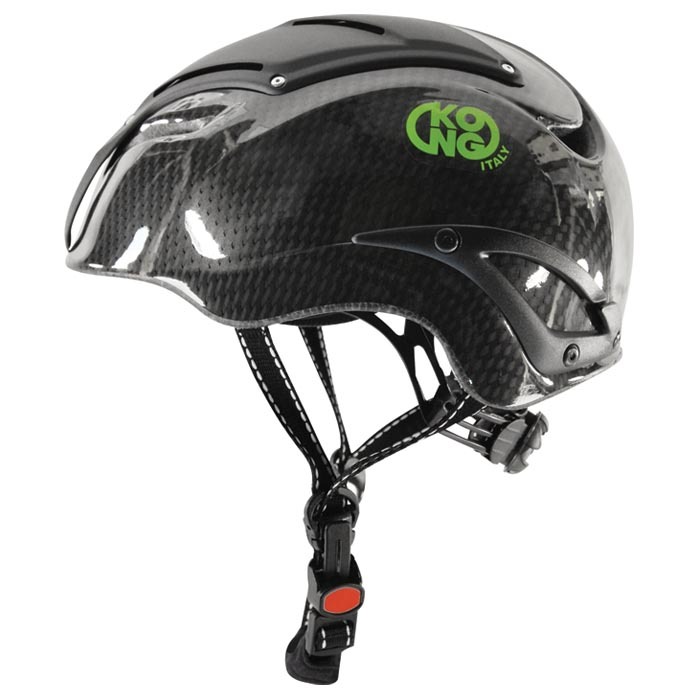 The Kong Kosmos helmet might be our new favorite multi-purpose helmet (since most of our "ski" helmets are actually climbing helmets). While it's not the lightest around (385g for a S/M) it certainly has the functional know-how to back up the beef. The adjustment strap sits really low on your noggin' and provides a secure wrap all the way around your head. 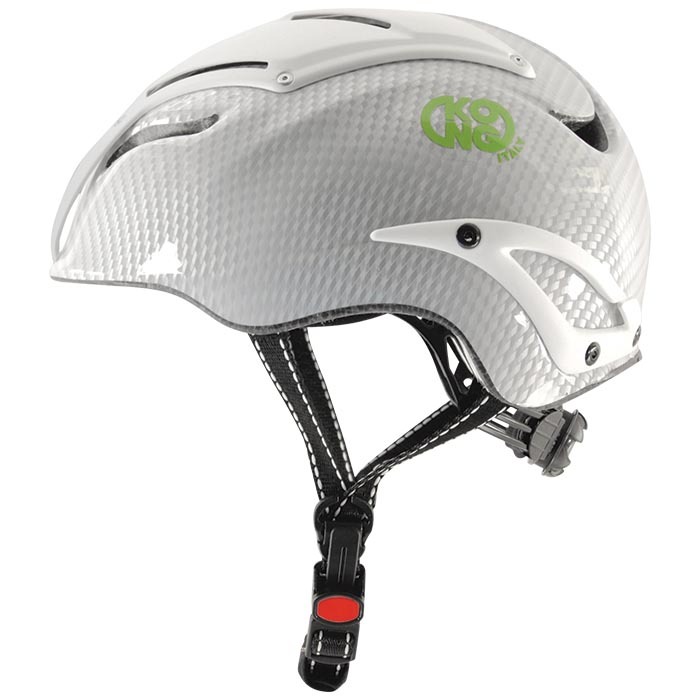 A single button operates the chin strap for on the spot customization even with cold hands. The vents on the Kong are what make it unique. 2 small openings near the front of the helmet collect moving air and direct it along the surface of the helmet until it reaches a larger internal vent where it is then circulated down to your head and out the back. The covers protect the vents from snow, pine needles, dandruff, and bugs, while still circulating air through the helmet. Dual CE and UIAA Certifications for downhill skiing and climbing. Ratcheting shoe buckle style chin strap is easy to operate with one hand. Polycarbonate shell minimizes rotational forces caused during a fall or rock strike. Secure front and rear headlamp clips securely clip your headlamp in the front and rear. Dressing like King Kong while wearing this helmet will cause a black hole. Materials Polycarbonate with a carbon finish. Notes Low riding adjustment strap makes for an impressively secure fit. Bottom Line A surprising blend of fit, weight, ventilation, and Italian-ness for a great price. I have a 60cm head with a ridge down the middle. Many helmets ride high. Also chin straps tend to cut into my throat if I cant adjust the chin strap location along the ear loops.  Can the chin strap location be adjusted? Is there a goggle retention clip on the back? I see some sort of clip on the front. Hi Lars, this helmet has a nice system for adjusting the chin strap location. The headlamp clips on either side of the back of the helmet also work quite well for securing a goggle strap. I was initially attracted to the Kosmos for its triple certification. If it is burly enough to pass all three certifications, then it must provide more protection over a typical climbing helmet, right? The Kosmos has been a burly companion from the dead of winter, all the way through spring and into the summer mountaineering season. It is one of the best fitting, most comfortable helmets that I’ve ever worn (for any sport). It is ventilated enough to wear uphill in place of a beanie without overheating on all but the warmest of days. The head cradle is quick to get situated and sits nice and low on the back of my skull. I appreciate this because in the case of a fall, it’s low enough that I don’t worry about it getting pinched between the shell of the helmet and my skull, which would really hurt. The sizing adjustment dial is quick to use, and provides a wide range. I can size it down to fit over my bare head, or dial it up to fit nicely over a ball cap and hood or buff combo. The biggest downside of the Kosmos is its weight. When the level of protection is considered it's quite a light helmet, but it is still a fair bit heftier than single certification climbing helmets. On the biggest of days when I’m feeling every gram of extra weight, I find myself considering a climbing helmet in place of the Kong. A few times I’ve tried lighter helmets on only to realize that while lighter, they aren’t as comfortable and don’t “disappear” on my head like the Kosmos. For that reason, I’ll continue to stick with this helmet into the future.